With Parkland, Florida marking the 18th school shooting in just the 43 days of this year, it is clear that gun violence is out of control. Yet, the National Riffle Association strongly stands against sensible gun control, and its millions of dollars in political lobbying finds its way in the pockets of our political leaders to do its bidding. Although virtually all politicians offer “prayers and thoughts” to the victims of these shootings, very few politicians actually offer solutions. 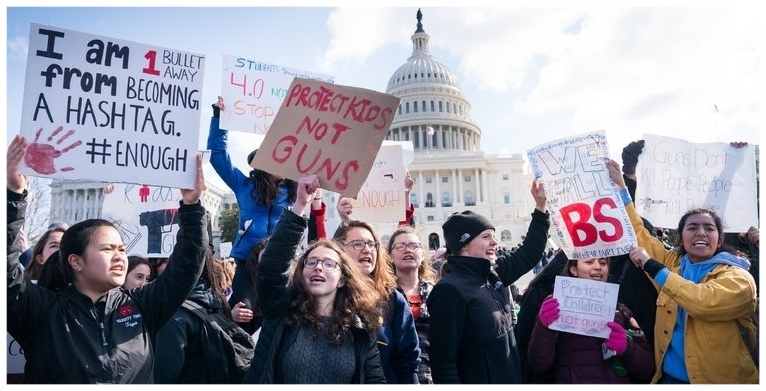 This article highlights several female politicians & other powerful women who are offering solutions to the problem, on a determined mission to reform gun control. Emma Gonzalez is a survivor of the Parkland school shooting and a current senior at Marjory Stoneman Douglas High School. Merely days after the school shooting, Emma gathered the courage and words to deliver a powerful speech at a gun control rally crowd in Fort Lauderdale, Florida. She expressed her frustration in how “When adults tell me I have the right to own a gun, all I can hear is my right to own a gun outweighs your student's right to live.” Furthermore, she condemned politicians who were remained deaf to America’s pleas for gun control reform- and exposed how with the thirty-million dollars politicians received from the NRA, the value of a human life to politicians came out to be only $5,800 with all the victims of school shootings in the first few months of this year alone. With her personal experiences of gun violence, Emma Gonzalez is passionate about calling out lawmakers and organizing nationwide student activism efforts to finally establish gun control reform. Recently, she faced down NRA spokeswoman Dana Loesch in a nationally aired CNN gun control reform debate. She also organized multiple peaceful student rallies for gun control reform at the White House, which has received national media attention. Currently, she is appearing on different media outlets telling her story, and is working with her fellow peers at Marjory High School to organize the national school walkout on March 14th to call attention to school safety from gun violence. In 2011, Gabrielle Giffords, who was a representative for Arizona’s 8th congressional district at that time, was speaking in a Tuscon parking lot when a mentally ill gunman opened re on a crowd. is incident of gun violence killed six people and injured 12 others, including Giffords, who nearly died of a gunshot wound to her head. To focus on her recovery, Giffords was forced to resign from the House. However, immediately following her recovery, Giffords established the organization “Americans for Responsible Solutions”, a “political action committee that advocates for gun law reform”. Americans for Responsible Solutions has been an important force behind individual states’ legislations for stricter background check requirements and bans on certain semi automatic weapons. Giffords continues to advocate for laws preventing domestic abusers and severely mentally ill individuals from purchasing guns and stricter penalties for gun traffickers. She states that “stop- ping gun violence takes courage...Now is the time to come together, be responsible. Democrats, Republicans, everyone. We must never stop fighting. Fight, fight, fight. Be bold. Be courageous. The nation's counting on you." After the San Bernardino shooting December 2015, Representative Robin Kelly became extremely vocal and active for gun control reform, stating that she refuses to stand silently while the death toll of gun victims across America continues to increase. “When is this gonna end? When are we gonna do more than stand?”, Kelly stated, as she expressed her frustrations at the House’s constant silent observances for gun victims but perpetual lack of action towards gun control reform. On top of her empathy for gun violence victims across America, she is especially passionate about gun control reform because of her district area of Chicago’s South Side that is heavily impacted by gun violence. Since the San Bernardino shooting of 2015, Kelly has introduced a number of key gun control measures in the House, including bills that prohibit the marketing of firearms to children, require the US Surgeon General to file an annual report on the effects of gun violence on public health, and allow the Consumer Product Safety Commission to issue safety standards on pistols, revolvers, and other firearms. She expresses her concern in how exacerbated gun violence in America is today, as "Gun violence has killed more Americans in the past 50 years than in every single American war—from George Washington’s Colonial Army defeat of the British in 1781 to Operation Enduring Freedom in 2014."